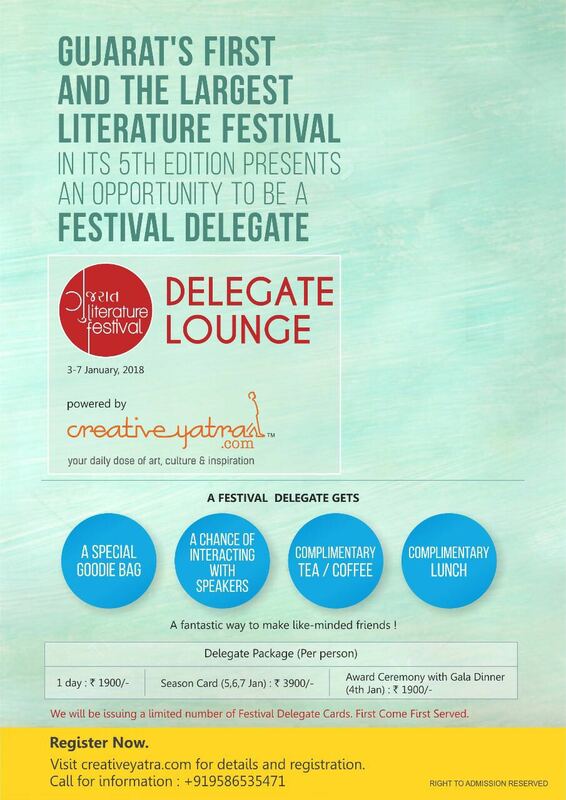 Gujarat’s first and the largest literature festival in its 5th edition presents an opportunity to be a festival delegate. With a footfall of more than 300,000 people, the contribution of more than 650 authors and extensive digital media coverage, Gujarat Literature festival has proved itself to be an ace of literary gatherings in the state. In its fifth edition kicking off on 3 January 2018, in the heritage city of Ahmedabad, GLF has become a five days affair teeming with literati hopping from across the globe. To get an otherwise inaccessible entry into a dedicated arena where top-notch creators will be available for you to interact, network and inspire, get your tickets for the CY Powered – Delegate Lounge today! Food is on the house for all delegates. A fantastic way to make like-minded friends! Visit creativeyatra.com for details and more information.